CNG: eAuction 438. RUSSIA, Empire. Anna Ioannovna. 1730-1740. CU Polushka (21mm, 4.17 g, 12h). Dated 1740. 438, Lot: 649. Estimate $100. Sold for $65. This amount does not include the buyer’s fee. RUSSIA, Empire. Anna Ioannovna. 1730-1740. 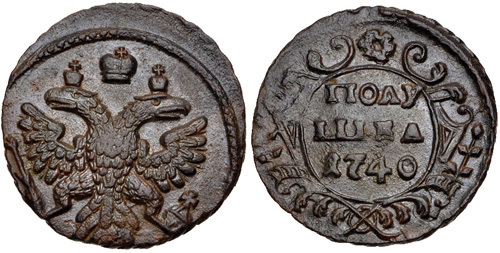 CU Polushka (21mm, 4.17 g, 12h). Dated 1740. Crowned double-headed imperial eagle facing with wings displayed, holding scepter and orb; crown above / ПОЛУ/ШКА and date in three lines; all within ornate frame supported by laurels and palm fronds; above, large rosette. Edge: /////. Diakov 1; Bitkin 382; Uzdenikov 2514; Brekke 17. EF, olive and brown surfaces. Excellent for issue.